First up, loyal reader Waldo spotted this Downtown Crossing store’s sign. As you may realize, they went with a Game of Thrones theme. It’s one that works just fine even if you have no knowledge of that show or the “Winter is Coming” meme. There may have been some internal dispute at this location, as they doubled up their signs. They started with a Halloween-themed sign which is inexplicably heart-shaped. 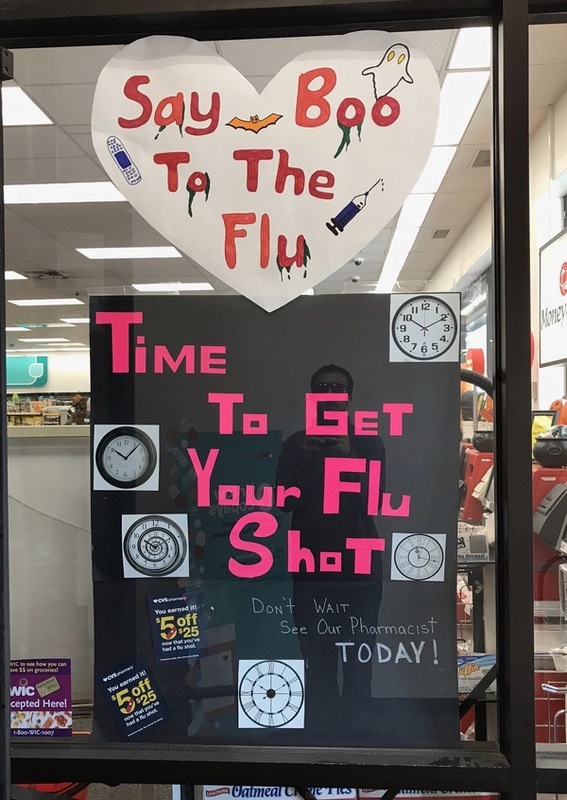 Below that is more instructive ad for flu shots, conveying urgency through an assortment of clock pictures. It feels a bit Twilight Zone-y, but it’s a solid effort overall. In addition to being rather leaky, the needle on this next sign looks incredibly blunt. 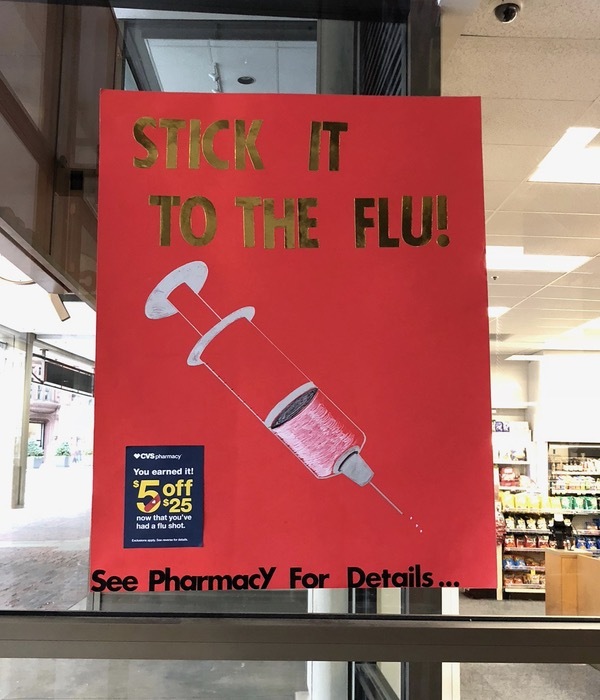 I would not like to get a flu shot with this needle. 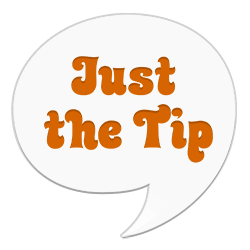 Identical silver glitter paper can be seen below, as well as a very similar needle. Fortunately, this one looks as though it could puncture the skin without too much difficulty. That “Stop” sign could really use some work though. In America, yellow traffic signs are general warnings (such as “Slippery When Wet”), rather than explicit instructions (“Stop”). 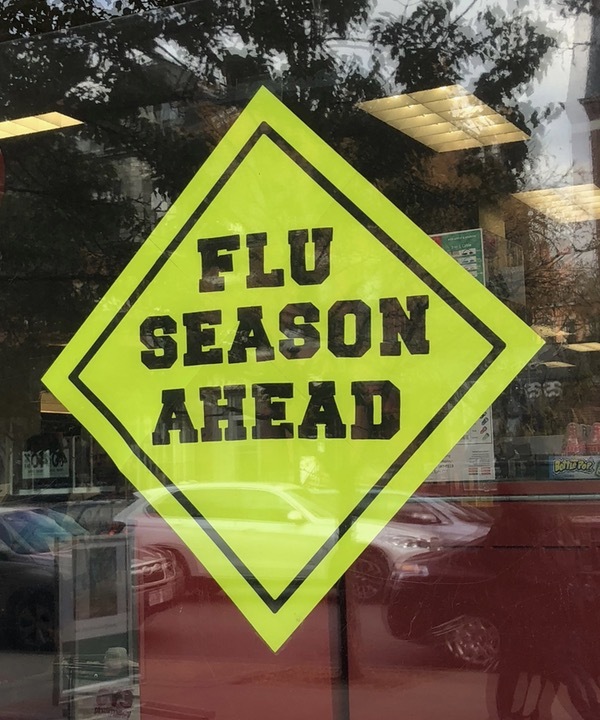 This sign doesn’t actually tell the reader what they should do about the upcoming flu season, so yellow seems an appropriate color. 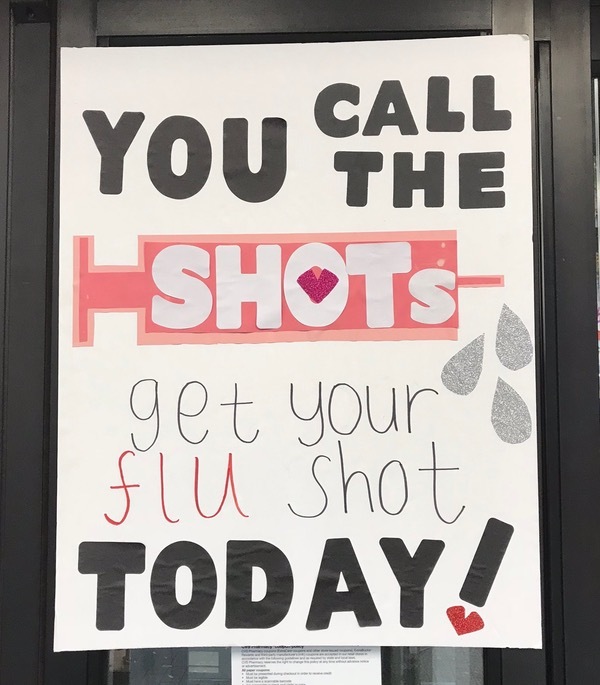 How many passersby simply mournfully shrugged and moved on after seeing this, certain in the knowledge that they’d catch the flu and feel like death soon? On the other side of the quality spectrum is this needle! 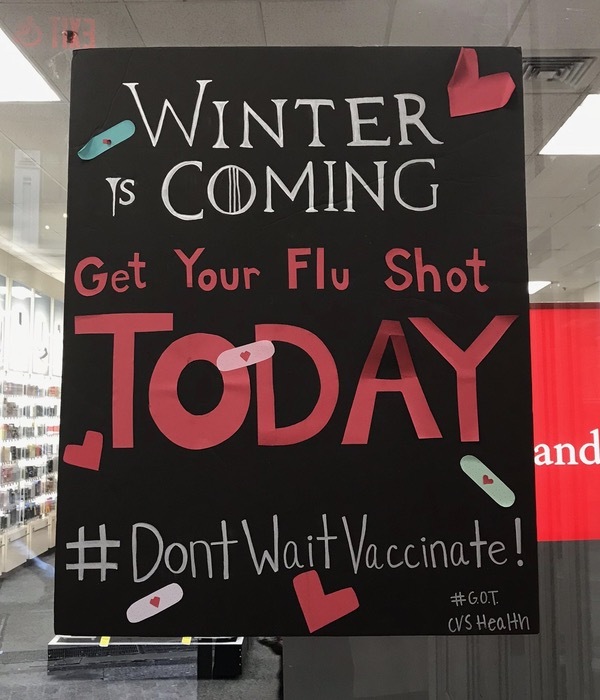 Well-done, Government Center CVS. I also appreciate the pithy writing. 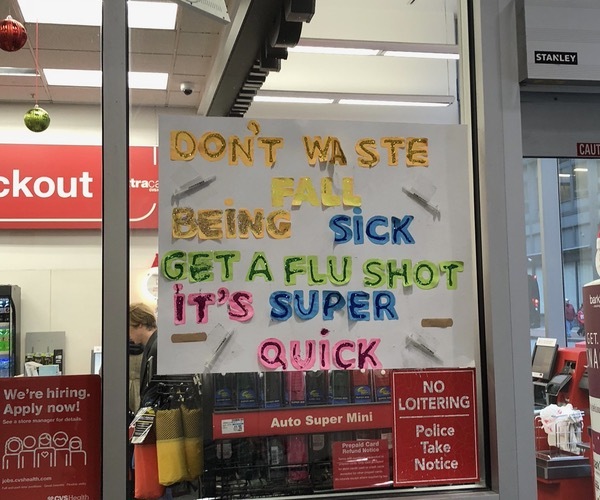 Meanwhile, these two stores had very similar rainbow colored signs, each utilizing a “sick”/“quick” rhyme. It’s possible one ripped off the other, as they’re only about 3/4 of a mile apart. Then again, each of these stores has a CVS location that’s closer to it, and it’s not the same location in the middle of them. 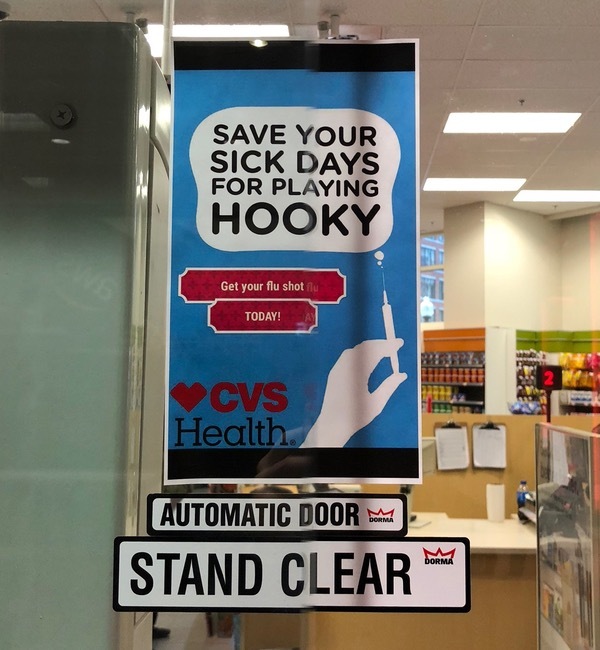 In CVS distribution terms, they’re not actually that close. This sign is from Maine, and they do things differently up there. 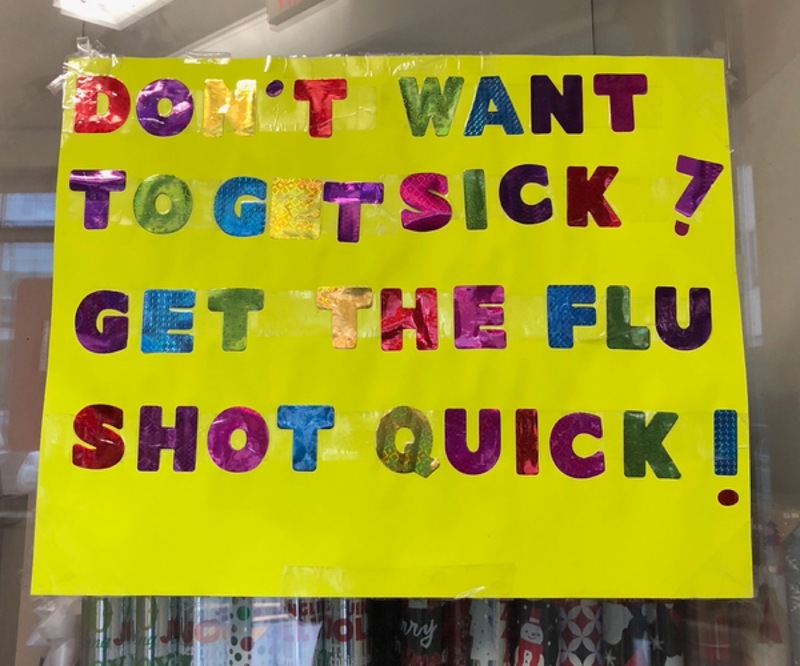 They’ve printed a fairly odd wordcloud of flu-related terms on glossy stock. 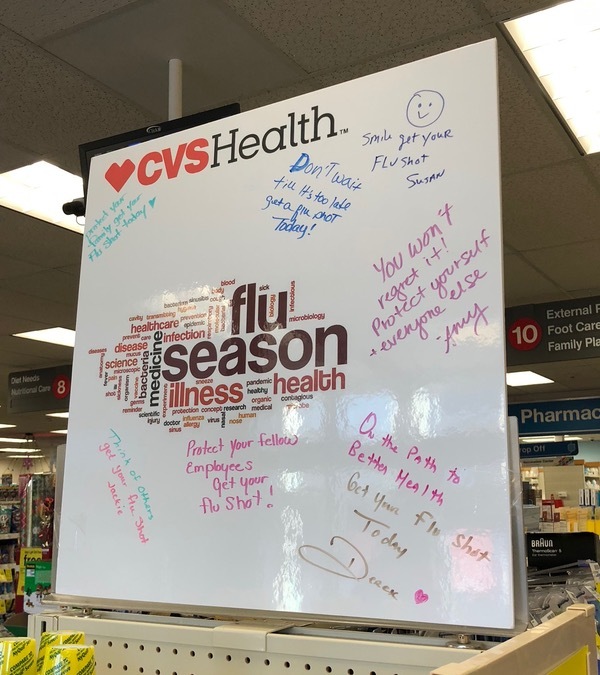 This is then surrounded by handwritten messages, presumably from CVS staffers. It’s unique, I’ll give them that. Finally, while this sign was printed on a relatively small piece of paper, rather than large posterboard, I love the design here. The message is the most honest of all we’ve seen, and it seems like the needle is thinking it in a cartoonish thought bubble. Nicely done. At this point, I’ve run out of nearby CVS stores to check on. 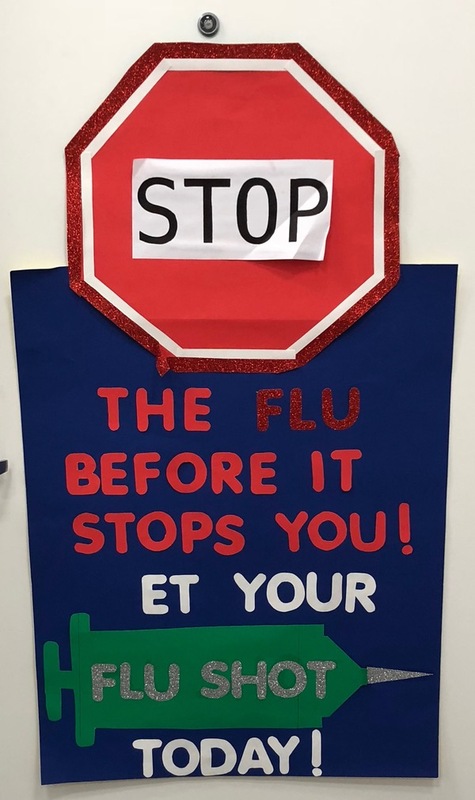 While flu season is ongoing, flu shot season is certainly winding down. Still, I’ll keep an eye out for more, and report back with this important news as it develops.